Influencer marketing is taking over social media channels across the board. Before social media existed, influencers came from those you saw on TV, a movie, an athlete, or well-known celebrity. Advertisers would have to put aside a significant chunk of their marketing budget to get these influencers to endorse their products. But times have changed. Anyone with an specific expertise and a following of 10,000 or more can be an industry influencer. So where do you begin finding the right influencer? This is the most important part of the process. The key component to choosing an influencer that works with your restaurant is that they have followers who are interested in what they are saying and posting to their page. This engagement can be seen through likes, comments, shares, and the mere fact that the follower began following them in the first place. The first best step is to find influencers that attract similar demographics to your restaurant and are located in the same place of business as you. You can conduct this search on your own by honing in on local businesses that share similar customers. There are also great looks like klear and TribeGroup that can help you find the right influencer. Create a list of local food bloggers, city bloggers, lifestyle reporters, local celebrities (such as a popular radio host), and connect with them. Once you’ve connected with your influencer the focus turns toward promotion. The promotion strategy could be as simple as an upcoming cheesesteak eating competition or a new sandwich you named in honor of your city’s sports team making it to a big championship. Your influencer marketing campaign will need to be fun, clever and out-of-the-ordinary for an influencer to actively promote it in a way that will connect with their own following. When it comes to the actual creative process, be flexible with your influencer. 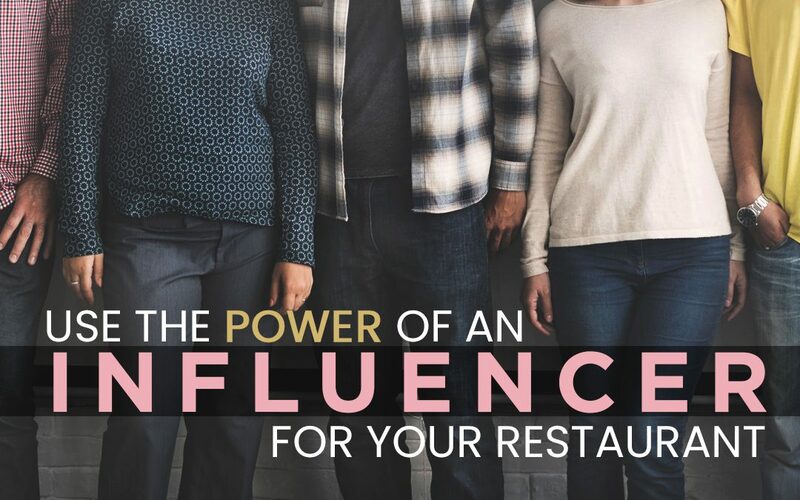 They are the ones who will know how to best connect your restaurant with those that follow them since they communicate with their audience on a daily basis. You will want to communicate ahead of time to strategize with your influencer prior to launch so all executions and deliverables are clear and match your restaurant’s brand and goals. Set a time and date to create that influencer experience (maybe they’ll come to your restaurant, do a live video of their experience, and offer an exciting review of your food). Always be sure to thank them for their support personally via email and on all social media posts where they are discussing your restaurant. You could also branch out from non-food related social media accounts. For example, let’s say you are an organic, health-guru restaurant located in Austin. There is a climbing wall gym located 2 miles away that is super active on all social media channels. You would want to begin following them on Instagram, Facebook, and Twitter to see how they connect with their customers. Pay attention to their tone, voice, and content. More importantly, check often to see what customers are communicating back to the business. From there, you can find local customers who might be able to benefit your restaurant. One of those customers who is interacting with the climbing wall Instagram page could be a local personal trainer that several residents hire, admire, and respect. By visiting that customer’s personal social media pages, you can learn more about them, their followers, level of engagement, and determine if they would be a good influencer to promote your restaurant. Finding an influencer can be a tedious process but it’s also fun and rewarding. So who will you be targeting for your next influencer campaign? You Want Your Meal Delivered Where?